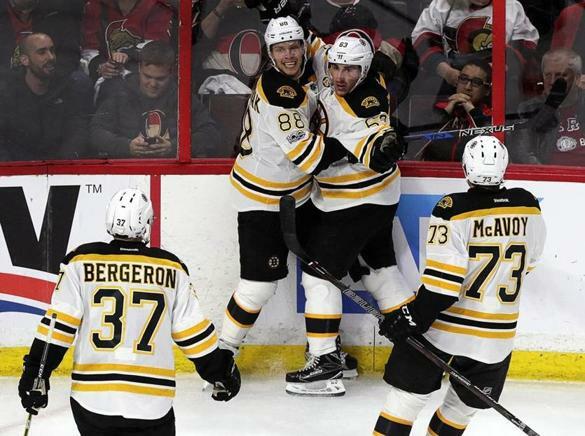 After going 0-3-1 against them in the regular season, the Bruins upset the Ottawa Senators 2-1 Wednesday in their first playoff game since 2014.
.@Frank_Vatrano's first career playoff goal tied things in the 3rd. Frank Vatrano’s first career playoff goal, and then another clutch Marchand moment to add to the collection. Mix in 26 saves from Tuukka Rask and a hell of an NHL debut from Charlie McAvoy and the result is a 1-0 series lead that no one saw coming. Game 2 in Ottawa will take place Saturday afternoon at 3. The thrill of playoff hockey is back!